No custom home wiring job is too large or too small for us to handle in Tampa, FL. 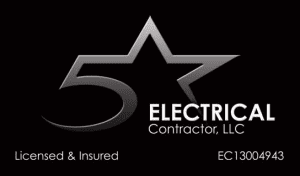 At 5 Star Electrical LLC, we’ve been providing the Tampa, Florida area with excellent electrical services since 2010. If you need a team of experienced electricians to help you out with an upcoming custom home wiring project, we’re the ones to call. One of the main things that sets us apart is our flexibility. As we get started on your custom home wiring project, we can work concurrently with your builder, contractor, or architect to make sure that your custom home is wired according to local codes and regulations. We’ve wired many custom homes throughout Florida and pride ourselves on the hundreds of satisfied customers we’ve created. We want you to be our next satisfied client and hope that you will choose our team to wire your new home. Remember, no custom home wiring job is too large or too small for us to handle. Not only can we successfully wire your custom home, but we can also help you with a wide variety of other electrical projects. For example, if you want your new home to have a home theater system, we can wire it for you. We can also help you with the SMART home setup process and can even wire your pool house or outdoor kitchen. If you have any questions about our custom home wiring services and what they entail, please don’t hesitate to contact us at 5 Star Electrical LLC. We are confident that you will be more than happy with the quality of our workmanship and the efficiency of our processes.